When running the Warsow gaming test, both the Intel and Radeon graphics had favored Fedora 13 over Ubuntu 10.04 LTS. The Mesa stack found in Ubuntu 10.04 LTS has a bug with Warsow where its frame-rate is consistently low (2~3 FPS) with the Radeon R600/700 ASICs, but this has since been resolved and is fine with Mesa 7.8.1 in Fedora. Improvements in the Clarkdale graphics performance with the Fedora 13 packages led to its frame-rate being 77% higher than under Ubuntu's Lucid Lynx. 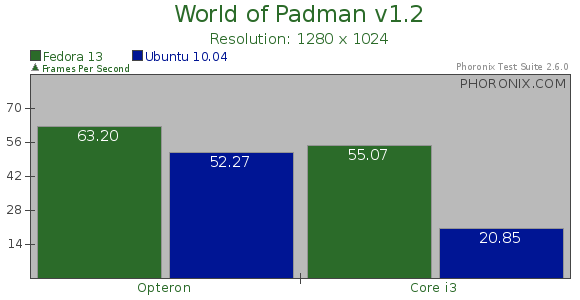 With the World of Padman game, Fedora 13 was again favored when using the open-source Radeon and Intel graphics drivers. The Radeon graphics were over 20% faster with Fedora 13 and incredibly more than two and a half times faster with the Intel Clarkdale IGP. Also worth noting is that Ubuntu does use Compiz desktop effects by default, which can cause a performance penalty. 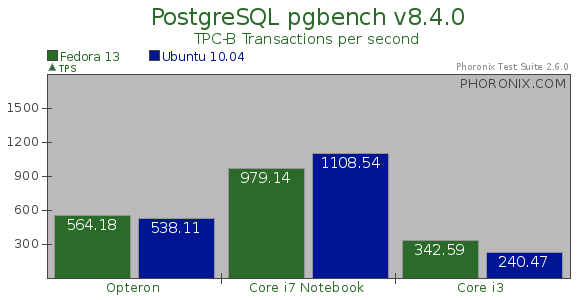 After finishing off the OpenGL benchmarking between Ubuntu and Fedora we next turned to the PostgreSQL database performance. 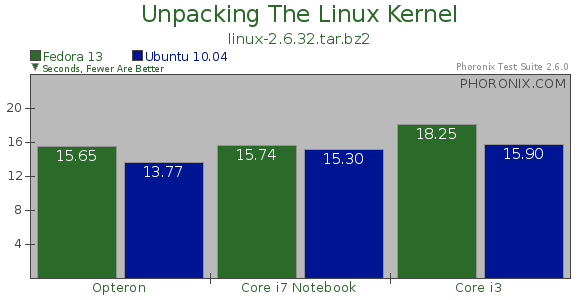 The Opteron system was about 5% faster with the number of transactions per second when running Fedora 13, but with the ZaReason notebook and its Core i7 CPU it was 13% faster when running Ubuntu 10.04 LTS. Lastly, Fedora 13 pulled another win with the Core i3 desktop where its TPS count was 42% higher than the Ubuntu Long-Term Support release. Ubuntu 10.04 LTS was consistently faster than Fedora 13 across all three systems when measuring the time to unpack the Linux 2.6.32 kernel source-code, but the margins were not too big between the two Linux operating systems. Fedora is geared more towards the Tux faithfuls, the experienced linux users, and hence Fedora distribution is always the first one to bring down the cutting edge Linux technology to their distribution, e.g. they were first to use new version of GDM, they were the first to release ext4 as standard file system for their stable release. Further through yum, Fedora offers an easy way of installing and managing packages. But being adventurous can have its side-effects too. New linux technology means more bugs, which translates to more crashes and more issues in compiling new modules and stuff. My personal experience with the recent Fedora releases have not been the greatest since Fedora 10. On the other hand, Ubuntu is targeted more towards the upcoming Linux lovers and noobs, so they are more careful in integrating new stuff to the distribution and try to keep the user friendliness on top of their priority list. But this doesn’t mean that it cannot satisfy the needs of a linuxphile. It has probably one of the most comprehensive distribution of pre-compiled linux packages available through its canonical repository. apt is a very matured and fast package management utility, to my understanding a tad bit faster than yum, and Synaptic package manager which is GUI for apt beats the crap out of yumex (GUI for yum) in terms of speed and user friendliness. Let me list out the pros and cons for both Fedora and Ubuntu and you can decide for yourself what you want. Up-to-date cutting edge linux distribution. Catering to linux experts, might involve some learning for noobs. Lot of additional packages and drivers available through RPMFusion repository. Upgrading used to be a hassle, but now with preupgrade command you can upgrade to the next distribution, though I haven’t tried it myself yet. New release can be a bit buggy and usually takes a while for most bugs to get addressed. Some softwares and applications may not be available as pre-compiled package, e.g. VMware Player doesn’t have a pre-compiled driver tool for Fedora while it has one for Ubuntu, but then thats not Fedora’s mistake. Sometimes compiling things from the source can be a bit of a hassle, especially for noobs. I had really hard time compiling the above mentioned VMware player tools package. I installed Fedora 13 on my Dell E1505 Core Duo Laptop with Ati Mobility Radeon X1300 using DVD media and couldn’t get any video acceleration. Reinstalled using Live media, got graphics acceleration and everything working, but now the screen would flicker heavily, using nomodset in the kernel boot parameter fixed it, but then I can’t get 3D video acceleration. Tried creating a virtual machine in VMWare player 3 and the VMWare tools won’t compile fully, even after put couple of hours of effort and trying everything I could and what I learn googling. Installing LAMP (Apache, MySQL, PHP) can be more “intensive” and less noob friendly. Slick and fast and usually more stable. Good for noobs as well as experts. Vast and probably most comprehensive package base. Upgrade to next release is much simpler and streamlined, software updater can handle it own its own, all you need is a fast internet connection. To maintain the user friendliness and sturdiness, they are slow in bringing forth the cutting edge linux tech. Support for old graphics card can be questionable. Some old graphics cards got black listed with Ubuntu 10.04. Installed it on my HTPC desktop, upgraded as well as did a fresh install on a different hard drive on the same old Dell E1505 Core Duo Laptop with Ati Mobility Radeon X1300 and got everything working for upgrade as well as fresh installs. Installed or upgraded for my Acer netbook, for netbook remix it worked without breaking anything. Won’t work on some older hardware due to blacklisting of older video cards. I couldn’t upgrade 9.10 to 10.04 on an old Gateway laptop which had Intel 82852/855GM. Installation of Apache, MySQL, PHP is far easier and least tricky with Ubuntu. Thats all the share of my experiences with the two. If you think I have missed something or have incorrect impression, feel free to point it out. Ideally you should give both of them a try, which is very easy these days with virtual machines, and then choose the one you like! Given enough time, you can master either of the two and fell in love with it.